How Do Little Frogs Fly? Small States in the International System. Lecture at Williams College, 8 October 2013. How Do Little Frogs Fly? Small States in the International System. Lecture at the Icelandic American Chamber of Commerce and the Consulate General of Iceland in New York, 4 October 2013. 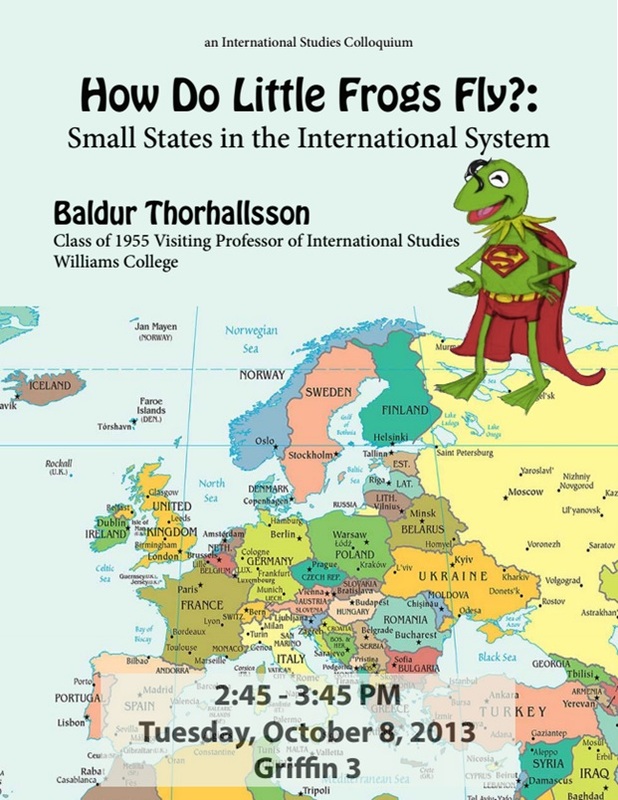 The Centre for Small State Studies and the Position of Small States in the International System. Speech given at the Eighth Conference of the Presidents of Parliaments of Small European States, Reykjavík, 27-30 August 2013. Small States in the international system and the EU. Lecture held for the Association of Social Sciences teachers, Reykjavík, 12. ágúst 2013. Queer History Walk. with Þorvaldur Kristinsson and Hilmar Magnússon. Public lecture/walk on the history of gay rights in Iceland, Reykjavík Pride, 6 August 2013. Scotland as an Independent Small State: Where would it seek shelter? Speech given at the opening of the Icelandic Review of Politics and Administration, University of Iceland, 26 June 2013. From Oppression to Rainbow Revolution: Queer cultural and legislative victories in Iceland. Speech given at Regional workshop, Organised by the “People 2 People” programme of the European Commission in collaboration with the Office for Human and Minority Rights of Serbia and ILGA Europe, Belgrade, 17 – 19 June 2013. Scotland as an Independent Small State: Where would it seek shelter? Speech given at the University of Greenland, 21 May 2013. Iceland’s External Affairs from 1400 to the Reformation: Anglo-German Economic and Societal Shelter in a Danish Political Vacuum. With Þorsteinn Kristinsson. Speech given at the annual Social Science Conference at Bifröst University, 3 May 2013. Scotland as an Independent Small State: Where would it seek shelter? With Alyson Bailes. Lecture for Scottish officials in the Scottish government at St. Andrews house in Edinbourgh, 1 May 2013. Scotland as an Independent Small State: Where would it seek shelter? With Alyson Bailes. Speech given at University of St. Andrews, 30 April 2013. Why do some Icelanders want to join the EU and why is the present outgoing government engaged in the accession process. Speech given at the Icelandic Association of Craft and Technology Industries, Reykjavík, 23 April 2013. Iceland’s External Affairs from 1400 to the Reformation: Anglo-German Economic and Societal Shelter in a Danish Political Vacuum, with Þorsteinn Kristinsson, at a Research Seminar in the Faculty of Political Science, University of Iceland, 18 April 2013. How do small states cope with recessions: The cases of Estonia and Iceland compared with seven corporatist small states. Speech given at a concerence on Lithuania's presidency of the EU Council, Institute of International Relations and Political Science, Vilnius University, 9 April 2013. Icelandic General Election 2013, Political Parties and the Political Situation. Lecture at Paris-Sorbonne (Sorbonne-Paris 4, Malesherbes, France), 22 March 2013.